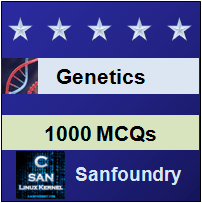 This set of Genetic Engineering Multiple Choice Questions & Answers (MCQs) focuses on “Markers”. 1. One of the commonly used markers is URA3 gene. It encodes for ______ biosynthesis. Explanation: URA3 gene is a commonly used selectable marker. It encodes an enzyme for uracil biosynthesis. The enzyme encoded is orotidine-5’-phosphate decarboxylase. 2. CAN1 gene encodes a permease that causes uptake of _________ analogue. Explanation: CAN1 gene encodes a permease that causes uptake of toxic arginine analogue. It causes consequent cell death. 3. Loss of SUP4 abolishes canavanine uptake, it is arginine analogue. Is the given statement true or false? Explanation: Loss of SUP4 abolishes canavanine uptake. It is arginine analogue. It causes canavanine resistance and cells can be readily selected. 4. Phosphoribosyl amino-imidazole carboxylase is a component of _______ biosynthesis pathway. Explanation: Phosphoribosyl amino-imidazole carboxylase is a component of purine biosynthesis pathway. The mutation for this enzyme is used in selection of SUP4 gene. 5. Cells that have lost SUP4 gene acquire _____ pigment and are visibly distinguishable from others. Explanation: Cells that have lost SUP4 gene acquire red colour and this makes them visibly distinguishable from others. This is the basis for selection. 6. Cells mutant in _____ gene can be selected by using 5-fluoro orotic acid, which is turned into ____ products by wild type protein. Explanation: Cells mutant in URA3 gene can be selected by using 5-fluoro orotic acid, which is turned into toxic products by wild type protein. URA3 gene is responsible for uracil biosynthesis. 7. The replicating plasmid vectors in yeast can be divided broadly into how many categories? Explanation: The replicating plasmid vectors in yeast can be broadly divided into two main categories. These are yeast centromeric plasmid and yeast episomal plasmid vectors. 8. Yeast centromeric plasmid (YCp50) contains ampicillin and tetracycline resistant gene. Is the given statement true or false? Explanation: Yeast centromeric plasmid contains ampicillin and tetracycline resistance gene along with an origin of replication. Explanation: CEN4 in YCp50is an example of chromosomal centromeric sequence. It allows partitioning of the plasmid in the same way as endogenous chromosomes are partitioned. 10. Yeast episomal plasmids have the following feature? Explanation: Yeast episomal plasmids are those plasmids which contain ARS sequence but CEL may not be present necessarily. 11. Cis-acting REP 3 sequence is present in Yeast episomal plasmids. Choose the statement which holds true for it? Explanation: Cis acting REP3 sequence is present in Yeast Episomal plasmids. It is a substitution for chromosomal centromeric sequence. It is having a similar stability than that of YCs but a higher copy number than that of it.